I have just finished editing my Korea trip photos but I will share about that trip later. First I would like to share my pending trips. Let's start with past 3 years holidays which require a passport. It would take a long time to blog if I were to blog about my earlier trips to KL, Ipoh, Langkawi, Melaka, Fraser's Hill, Bukit Tinggi, Cameron Highlands, Genting Highlands....and the list goes on. Star cruise Libra has been on Penang shore since the beginning of 2011 so my boyfriend (now husband) decided to experience the ride. 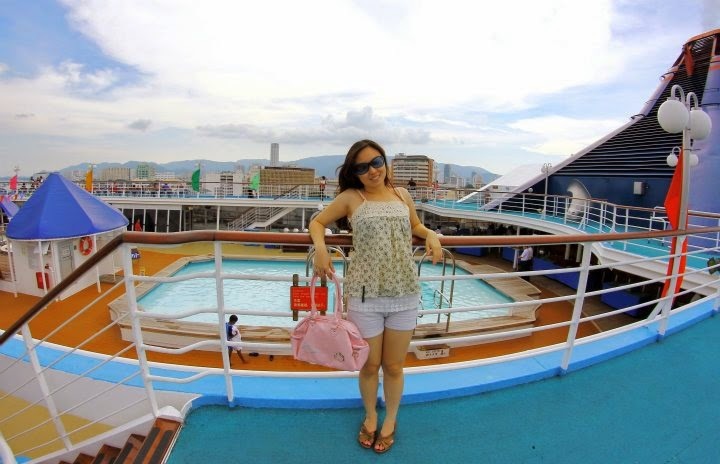 We love cruises and this is the third time we sailed after Pisces in 2010. We bought the package in Matta Fair randomly from Hwajing Travel & Tours. The package of only RM800+ per pax includes 4 days 3 nights stay in a stateroom, fuel surcharge and insurance. For on land tour, you may choose free and easy or simply buy 1 day tour from the cruise lobby like we do. Regret that we did not choose to tour James Bond island when we landed on Krabi. So let's begin our journey as I will caption the pics below. Hope I could recall the details. We boarded the cruise in the early morning. The documents needed from you would be your IC and your passport. Then you will be guided all the way till check in. When we checked in to our cabin we were shocked to find a full window instead of a porthole or no window at all like our previous stay with Pisces. Then we found out we got upgraded to Oceanview Stateroom instead of Inside Stateroom with no surcharge. It's a small room with two separate single beds. The bathroom is even smaller. Let's find our way to the lobby. I remember there are about 7 or 8 floors we can move around. The casino is at the lowest floor we call it the basement. It was August 21st 2011 and we were so excited. Usually we would only stay 1 night on board but this is 3 nights! I was afraid I would get seasick and couldn't sleep well but it just feels like baby rocking in the cot. 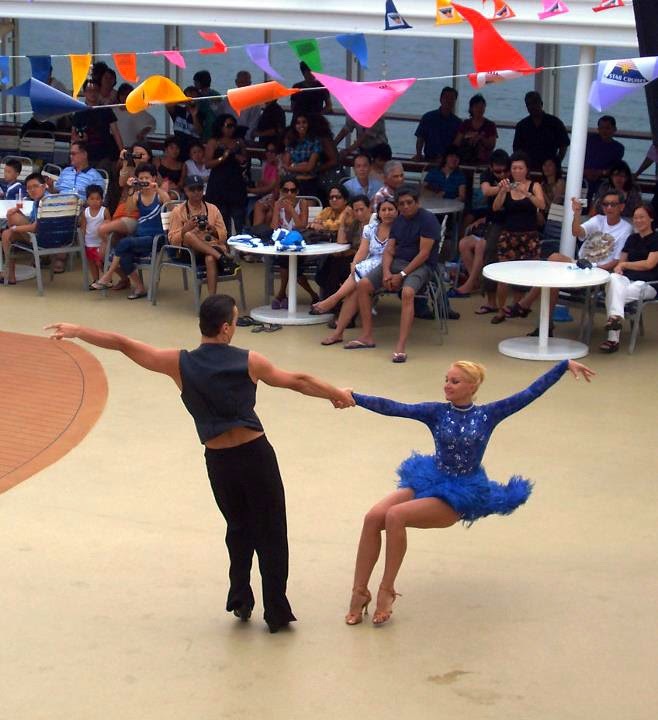 The crew has prepared resort feel experience and entertainment throughout the trip making you feel like sailing on the Caribbean. After unpacking, we went out to view the lobby. 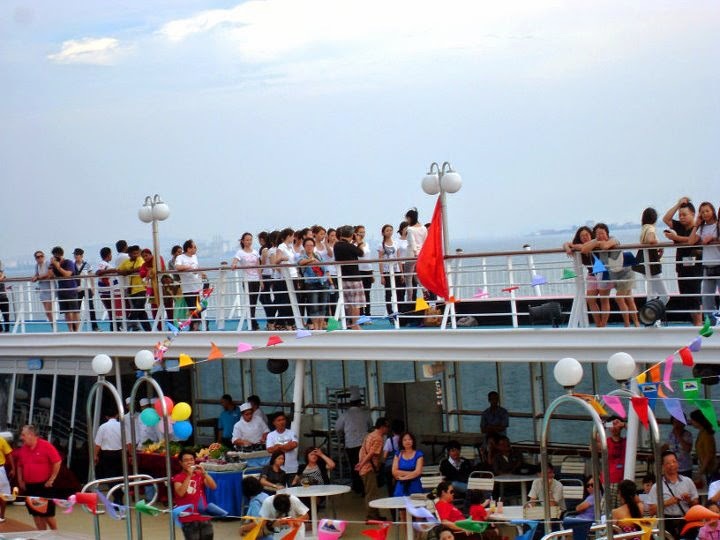 There were announcements about activities on board, mini contests, games, schedules and most importantly choosing your tour for the following days. If not mistaken each tour costs from RM150-RM200 per person and they include a lunch. Breakfast and dinner will be on board and those free and easy tourists will have to come back to cruise by 11pm. Next, we headed outside to the pool area and explored around. The crowd were dancing. It feels as if we were sailing across the Caribbean. So much entertainment! We even have Lady Gaga! Talented Shakira look-alike. They performed at night at the Stardust Lounge. First heat up show is free. Miss Astro Chinese International Pageant 2011 contestants practicing catwalk on the long runway. After joining in the dance, we went into the Mariners buffet restaurant for tea. We did not took any photo of the international BBQ buffet dinner because we were too hungry and there were too many people but I tell you the buffet was awesome! After dinner we walked around the deck, enjoyed the sunset and peek into the casino awhile. We don't know how to gamble or even play a simple card game so casinos weren't our thing. 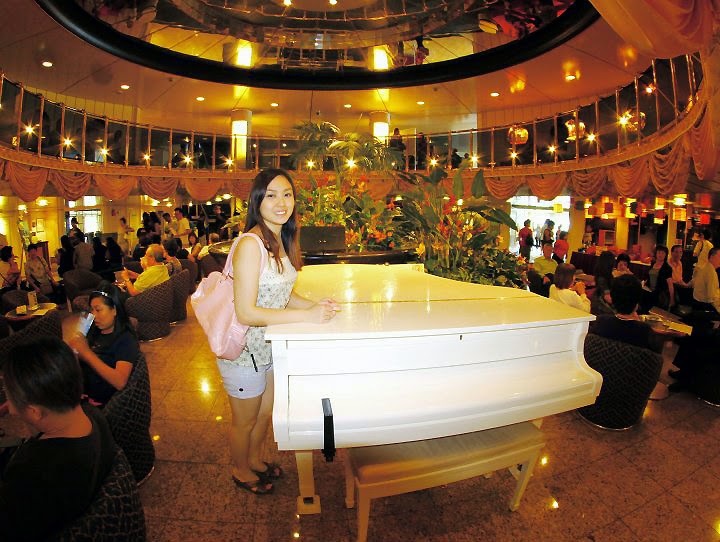 There were karaoke, lounges for you to relax and play bingo, spa, gym etc. We also went into Stardust Lounge for some cabaret dance performance. It's free for the first night but special magic shows and mild adult shows were RM50+/- per person. Will tell you about a fun in the show we attended on the third night but too bad no pictures because no photos allowed however we managed to snap an overview of the lounge just to let you readers see in the next post. 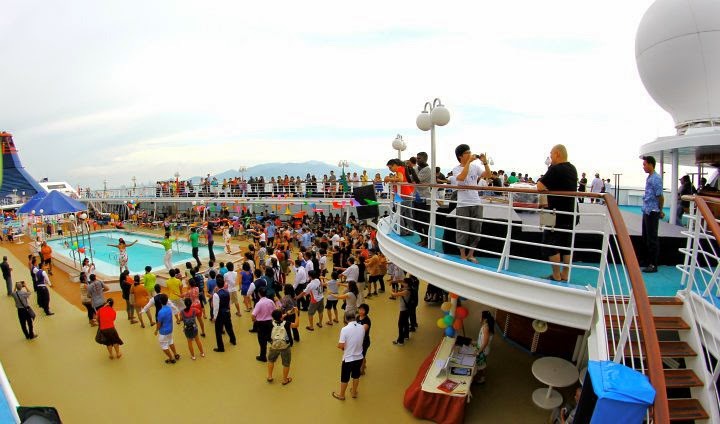 Yes, it is so wonderful to travel to Phuket and Krabi by cruise. The experience is beyond words. There are so much activities lined up for you by the super friendly crews. Oh damn I miss it so much. 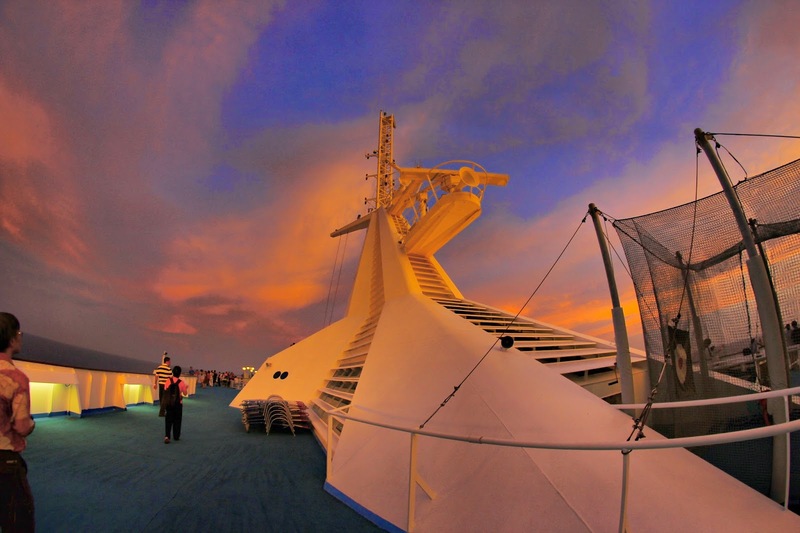 Very nice cruise. I must try it, where does the cruise start from? If you read above, I mentioned Libra has been on Penang shore since 2011 but now as of 2016 Superstar cruises no longer dock on Penang port. You can board from Hong Kong, Xiamen, Nansha etc. How is the activities ? The experience must be wonderful to be at sea. There are lots of activities you can do like swimming, arcade games, gym, spa, karaoke, movies in the teather and watch some live performance.